Before I deal with the atonement, let me explain why I have concerns and why I believe that this theology is a gateway doctrine to heresy. 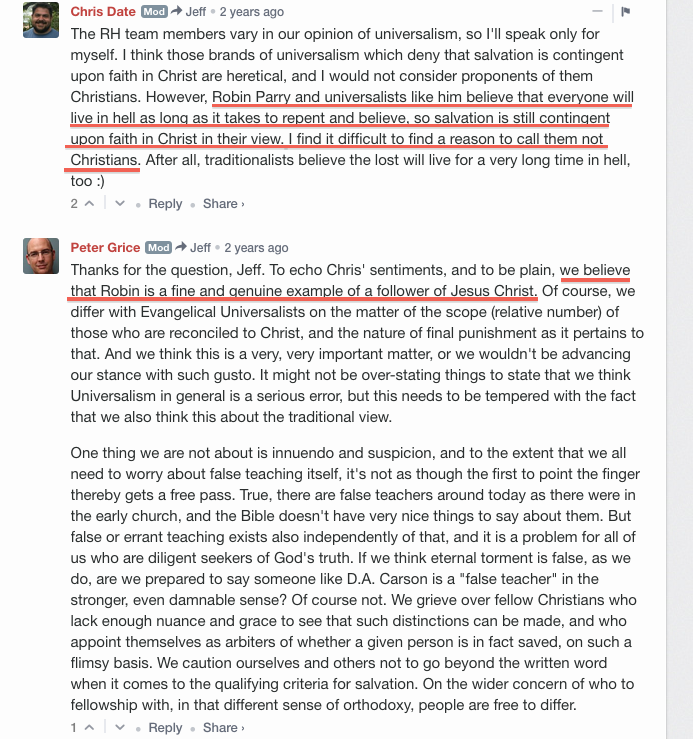 If we were simply discussing the nature of hell, then a secondary conversation could possibly be had without any consequence to salvific implications (maybe), IF the person is simply inconsistent by believing this position, or if they are not a popular teacher saying our view is closer to heresy, like Chris Date says (you’ll see below). This is the type of conversation conditionalist strive for. They want to treat this as merely a secondary issue. This is the proverbial “seat at the table” Chris Date and the Rethinking Hell contributors beg for. And this would be all fine and dandy if it were not for the fact that having alternate views of the afterlife affects your view of the atonement. * And, if it weren’t for the issues below. “…the Bible never says that God was “angry” with Jesus on the cross. Scripture never expressly speaks of Jesus as the object of God’s “wrath.” The Bible never states that God “punished” Jesus, and it never specifically refers to Jesus receiving God’s “punishment.” The three places where the New Testament speaks of Jesus’ death as a “propitiation” for sin emphasize God’s righteousness and forgiveness (Rom. 3:25), Jesus’ advocacy on our behalf (1 John 2:2) and God’s love which that death demonstrated (1 John 4:10). This reminds us of the wonderful truth recorded in John 3:16, that God “so loved” the world that he “gave his Son.” The Father loved us before Jesus died for us. He did not hate us until Jesus died and then have a sudden change of heart. (emphasis mine, article found here). Just like anything else, I encourage you to read the whole article. In another article, Fudge asserts that propitiation and appeasement of God’s wrath is not meant to depict God’s anger satisfied in punishing Jesus. But then, in another article, in contradiction to his previous statement, he says he affirms penal substitutionary atonement (PSA) as a biblical idea, but states that it doesn’t “enjoy a prominent place in Scripture.” He goes on to explain how the other views provide a complimentary/fuller look on the atonement. And it is because of people like Fudge (and others who I have read who affirm conditionalism/annihilationism who seem to be unclear about their view on PSA) that I remembered that there are some (not necessarily Fudge) who may argue for some type of substitution in regards to the atonement, but it is not penal in the sense of Christ taking the wrath/punishment instead of us. Even those who hold to the heretical Governmental Theory of atonement (look it up) believe in concepts like “substitution,” “punishment,” “propitiation of wrath,” etc., but they apply those terms much differently. Now, there are some conditionalists that might say that Jesus took the actual punishment, but that it is death. But then they wrongly equate the first death that Jesus and every human will experience until the New Heavens and New Earth, with the second death, in which they make a categorical and semantic mistake by assuming that second death means annihilation. Because of this. I suspect that Fudge, and some of his leaders in this camp, probably believe that the wrath of God and divine justice was appeased the moment Jesus died, not when He said “It is finished.” In other words, it seems that they believe the penal aspect of His atonement is demonstrated in dying, not in enduring God’s wrath before He dies. Of course, in saying this, I don’t deny death as a necessary aspect of His atonement. Just revealing the hairs being split. More about this later, but here is a quick disclaimer. In my many years as a traditionalist, I viewed Jesus’ cry from the cross through the lens which was so often used when I heard it preached, namely, the alienation of Jesus from the Father by his being made sin. I do not deny the truth of that proclamation at all. But, over time, that moment assumed an importance in my understanding of the atoning work of Christ which I now see to have been misconstrued (emphasis mine). I came to see that time, and that interaction between the Father and the Son as the supreme moment of Jesus’ accomplishment of our salvation. The Father’s righteous wrath was poured out, and Jesus, in our place, bore our sin “in his body on the cross,” as Peter put it, with Isa 53 very clearly in his mind (1 Pet 2:24). But, because I saw the Son’s satisfying of the Father’s righteous wrath against sin as of utmost importance, I came to think of that moment as virtually the time at which Jesus redeemed us. (Teissen’s emphasis) I didn’t explicitly say this, to myself or others, but I was working with that concept in mind. I hope to address this and other quotes like this in other parts to this series, but my intention here is to first reveal the concern that conditionalism should cause us who believe PSA and eternal conscious torment, as well as the heretical doorway it offers for enemies of the gospel to come in and make their bed among us. In the article linked above, Dr. Teissen briefly plugs his view of Incorporated Righteousness (IR) which has been another “clarification” against Imputed Righteousness. Discussions regarding IR and the nature of justification by faith goes back to the “New Perspectives on Paul,” and even some have had this kind of discussion among the “Evangelicals and Catholics Together” camp debating the distinctions of infused vs. imputed righteousness. Long story short, Dr. Teissen has written his thoughts about this debate and has expressed his “dissatisfaction” with Luther’s and Calvin’s understanding, and, in my opinion, gives a theological nod to the idea of infused righteousness even though he attempts to redirect his thoughts concerning it. The big point here is that his holding to incorporated righteousness instead of imputed righteousness gives me pause once again. And I think Dr. Teissen subliminally reveals why this view of justification is consistent with his view of conditionalism because of how they interpret death in light of the work of redemption. Once again, I wouldn’t disagree with death being a part of the application of how Christ’s righteousness saves us, but IR falls short of biblical, soteriological application. In other words, it fails to demonstrate how salvation is accomplished and imparted. And even though Teissen stated that God’s wrath was demonstrated on the cross, it is clear he has a different view of how atonement is made and applied in light of that. The difference and dispute that goes into this discussion is beyond the scope of this article. For now, just know that much of the arguments of IR can be akin to N.T. Wright’s outspoken protestation of imputed righteousness. If you want to read up on the position of incorporated righteousness, you can find an article here. One interesting point to ponder is that N.T. Wright also has a bizarre view of hell in which we become less human over time. I wish this were enough, but I’m afraid there’s more. Chris Date is the primary orator for this position. I’ve spoken with him over the phone a few times, and have addressed several challenges to him about his position. I have even invited him to have a public dialogue about his views with me on my podcast, but so far he has rejected my request for emotional reasons. Nevertheless, his language pretends peace, but makes war. More often than not, although he has requested “peaceful” discourse in which we can have a “orthodoxical” discussion among “brethren,” it is hard for me to feel as though this is the case when he too expresses his own reasons for rejecting eternal conscious torment. …when many traditionalists say that Christ died in the place of sinners, what they really mean is that he suffered pain in their place. At best, they are simply unaware of the inconsistency. At worst, this is disingenuous doublespeak that doesn’t actually answer the conditionalist challenge. Either way, when used to defend the traditional view of final punishment, this reasoning renders the Lord’s death an afterthought at best (underlines mine). “We see, then, that according to the traditional view of hell, Jesus bore the punishment of hell—separation from God and infliction of suffering—completely on the cross up until his life left him. This flatly contradicts the biblical testimony which consistently identifies Christ’s death as primarily that which he bore on behalf of the elect. Paul tells the Romans that “at the right time Christ died for the ungodly,” and that “God demonstrates his own love toward us, in that while we were yet sinners, Christ died for us” (Romans 5:6, 8). Later he tells them, “Do not destroy with your food him for whom Christ died” (Romans 14:15; compare with 1 Corinthians 8:11).” (underlines mine). At this point, I have much to say, but it is very difficult to put it all in writing without writing a book. All I want you to understand is how this position attacks the connection between eternal conscious torment and the biblical view of understanding the atonement – that is, Jesus Christ bore God’s wrath while conscious, atoning for sin, and then died after He said it was finished. But because they reject eternal conscious torment and the necessary link between that and how Christ paid for our sins, they shift their understanding to fit their view. In other words, because they wrongly equate annihilation with death (the second death really), they focus in on Christ dying with greater emphasis. And while they accuse us of minimizing the death of Christ and its application, I challenge that they minimize and render His suffering unnecessary, as I alluded to earlier. If Christ fulfills the punishment for sin by simply dying, why suffer the way He suffered? Why endure God’s divine wrath and exquisite pain in our place? The whole of Christ’s work is not an either or issue. It’s and/both. ** Placing emphasis on His death may prove their point about an important component of substitution, but once again, it does not prove their position of annihilation. And it can be made most certain that His death on the cross cannot be equated with being annihilated in the lake of fire. But of all things about conditionalism, this next section should raise the volume of alarm. When you think of Universalism, if you understand salvation and Christ’s work on the cross biblically, you should automatically reject this as damnably heretical. Any form of Universalism should be preached against and cried down as enemy of true gospel preaching. Unfortunately, the Rethinking Hell ministry does not share that soteriological stance. Robin Parry is a preacher who believes in something called Evangelical Universalism. In essence, it believes that hell is restorative, and not retributive. In other words, hell is not eternal conscious torment, but a place in which restoration is the end goal (this reeks of the Roman Catholic doctrine of purgatory). You can see an interview here about what he believes. The above is too stomach turning for me to reiterate with explanation. You can find the location of these comments here. To question eternal conscious torment as being biblical may be a conversation we can have, and discussing the nature of Christ’s death in atonement as affirming annihilation may cause my spirit to stir with suspicion, but to see this view being affirmed as a view that can be held within the realm of orthodoxy is further proving my concern on how the conditionalism camp is swinging open the gateway for other heretical views. And even though Chris and Peter disagree with Robin, the fact that they affirm him as a brother is deeply disturbing. And I wish it were just Robin Parry that Rethinking Hell accommodates. Open Theist, Greg Boyd, is another known heretic on the Rethinking Hell Playlist who not only rejects eternal conscious torment, but guess what else? Penal Substitutionary Atonement! He also endorses Rob Bell’s heretical book, Love Wins, and believes in annihilationism. Furthermore, he says he affirms the Christus Victor view of the atonement (which is best viewed through the lens of PSA), but he often sounds more like someone who believes in the Moral Influence view (look it up) at times, appealing constantly to God’s love to affirm his annihilationism and rejection of PSA. Regardless of which view Greg Boyd holds to, if you were to go to the Rethinking Hell Youtube page, and go to their recent playlist for their conference, you will find even more of those outside orthodoxy. Like heretic Brad Jersak, who recently wrote a book called, A More Christlike God. But Brad believes that God did NOT punish Jesus on the cross. And guess who endorses his book? Heretics like Brian McLaren, Robin Parry (above), and William Paul Young (author of the Shack). Here is a linked portion of an interview (around the 29 min mark) where Brad blatantly affirms that Jesus was not punished by God. He was invited to speak at the recent Rethinking Hell Conference this past September with Unitarian, Jordan Wessling, and other Universalists. Like Peter Hiett who made a video that not only blasphemously presents his view of universalism in relation to the atonement, but presents a view of eternal fire so bizarre, that he even proposes that the fires of Sodom and Gomorrah was a manifestation of God’s love, and that the dead in Isaiah 66:24 who are consumed by fire/worm are “rebels,” to which he also says includes the Messiah! And conditionalists want a seat at the table of orthodoxy while they invite heretics to dine with us? Sounds like they not only want us rethink hell, but universalism, unitarianism, and perhaps other heresies. There can be a plethora of rebuttals that I’m sure the leaders of conditionalism may conjure up. But there are two that are usually used in this type of discussion. And when they are, it seemingly diffuses the problems I presented above, but not really. I cannot dedicate much time to both of these rebuttals, but I only wish to quickly address them in case they are made. 1. There are heretics that affirm eternal conscious torment (ETC), so does that mean this position is also a gateway to heresy? How ever the question is worded, the attempt here is to distract from the problem at hand. While there are heretics like Oneness Pentecostals that may affirm ETC, this view does not, within its own theological construct, permit such a heresies to be mingled. The fact that there are heretics that may believe in ETC, the position does not lend itself to open the door. People may wish to lessen the impact of ETC, they may offer alternate means of salvation that widens the scope so that less go to eternal punishment, and they may also assert unbiblical views about God’s divinity, but there’s nothing within the theology that allows for such modifications or assertions, especially in correspondence to penal substitution. Conditionalism (and sometimes other forms of annihilationism), on the other hand, forces us to look at the nature and application of the atonement differently. And seeing that we are talking about the nature of God as well as how He distributes justice, the nature of annihilationism and how some conditionalists present it quench the necessity of Christ’s penal suffering, and also, as you have already witnessed, allows for some other abhorrent preachers to share their own insights concerning how God will judge the wicked. 2. There are various views of the atonement throughout Christian history (even by the Church Fathers), and penal substitutionary atonement is the more recent of them all. Does that mean anyone who does not affirm PSA is not a Christian? It depends. Because this is such a vast can of worms that some heretics love to bring into the mix, I will let the rabbit run the trail alone and simply say one overarching statement. The fact that we now possess greater, clearer, and more systematic knowledge of PSA should never cause us to abandon or doubt it. Church history could not understand “ransom” or “sacrifice” without it whether they were aware of it or not. But if our authority is Scripture, we should lean heavily on that. I would love to get into what the Church Fathers believed (especially regarding their views of Hell since some within Rethinking Hell make much of that), but bringing up past views about atonement does not do away with the current problem of what we are dealing with above. It may inform our judgment, but it cannot cancel out the problem at hand. And if one must bring up the “Church-Fathers-believed-other-views” card, it is a implicit admission that there is something amiss with their current view. In future articles, I fully intend to break down the particulars of how death is viewed in Scripture, meanwhile showing more of my concerns on how conditionalist’s atonement leaves the door open to heresy. Not only that, I fully intend to address how eternal conscious torment is biblically consistent with PSA, and the nature of what the apostle John calls the “second death.” For now, I hope I have raised enough concerns. And provoked us to ask questions like, “Why would this group make such distinctions concerning the application of the atonement in light of their view of annihilation? And why would they have others, who seemingly spurn PSA and also have abhorrent views concerning the nature of divine justice, invited on their shows and conferences? Unless of course they don’t see it as a problem. Which is a problem. Much more can be said, and much more will be written. If you haven’t taken the time to go through all of the links above, I would highly recommend it. I also recommend reading this series in full if you have not done so. Next, remember to study the various atonement views out there and become familiar with how penal substitution atonement works, what is imputed righteousness, and how eternal conscious torment ties into all of that. Furthermore, learn to detect the subtle linguistic nuances and hermeneutics that conditionalists use to affirm their theology. Moreover, it is good to recollect that just because Jesus Christ died, it does not follow that the wicked will be annihilated. The first and second death are different in nature, and even those of us who do not study linguistics can figure that out. Lastly, beware the company that conditionalists keep. It is okay to discuss, dialogue, and debate about Scripture, but the essentials of soteriology should not be compromised. I leave you with a passionate plea. Take this position serious. That fact that many have abandoned sound biblical doctrine in western churches leaves us vulnerable to this and other unbiblical positions. This position is becoming popular, not because the hearers are using sound exegesis, but because the liberal soil has made room for something like this to take root. We need to share this with our friends and family and warn them. We need to share this with mainstream and local pastors and scholars. We need to reveal the heretical direction this, and other positions like this, will take us. If you run into those who are learners and not teachers, warn them and teach them with much patience. If they are teachers and preachers of this view, warn them and try to win them. But if they will not listen, they must be rebuked, warned about, and avoided. We are to be on the offensive now. * I am talking about implications and theological consistency whether one is aware of it or not. As I said, there may be some who hold to this ignorantly and may not realize how their view fits together. But to act as a teacher is to place oneself in a dangerous position. Ignorance is no excuse, especially in dealing with atonement. ** What makes this topic so difficult is that conditionalists seemingly “affirm” God’s wrath in one breath, but subtly change their application. They sometimes say they agree with wrath being a necessary component, but it is clear that they understand these things differently or else why would they make such a clamor about it? Don’t be fooled.